Vulcatherm® temperature control units are automatic units designed to heat / cool all industrial processes through circulating fluid (water or oil). Due to its high efficiency, strong construction and accuracy, this technology is particularly suited to processes used in the plastics industry (composites, injection moulding, etc. 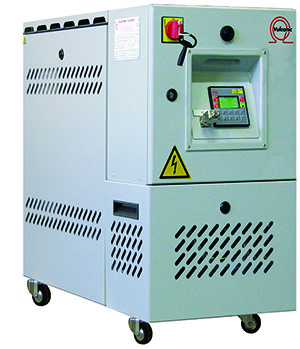 ), test bench equipment or control of jacketed reaction vessels. Vulcanic offers a wide range of Vulcatherm® temperature control units with heating capacities of 3 to 245 kW and capable of controlling temperatures from -50°C to 350°C. Vulcatherm® can adapt these compact units in order to suit all plant configurations (electrical and hydraulic constraints). 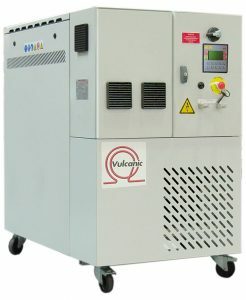 Vulcatherm® temperature control units are equipped with an electrical heater, pump, electrical cabinet with integrated HMI (connection for Modbus, Profibus, Canbus) and process control and safety sensors. The unit is protected by a stainless or coated steel casing. The cooling capacity is controlled by a plate heat exchanger, air fan or integrated chiller. Vulcatherm® temperature control units are designed and manufactured either as part of our standard range or as a customised solution in our factory at Neuilly sur Marne. All units are CE marked, compliant with European directive 2014/68/EU (PED).